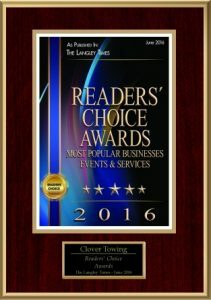 Clover Towing has been in the towing transport business for 35 years. We set the benchmark for professional towing services. Clover Towing has highly trained and uniformed drivers. Our modern fleet of trucks for Langley towing and Surrey towing services shows our commitment to excellence, customer service, and accountability. Is There a Towing Company near Me? Yes! With our large fleet of over 50 tow trucks spread out across the Fraser Valley in Langley and Surrey, we can get to you quickly if you have an emergency, or at a pre-arranged time if your needs are less pressing. Whether you need towing from a breakdown or accident or towing for a motorcycle or heavy-duty machinery, Clover Towing can get the right tow truck and an experienced driver to you quickly. We are also able to mobilize our large fleet of tow trucks for jobs around British Columbia. Clover Towing has been in the towing transport business for 35 years. We set the benchmark for professional towing services. Our highly trained, uniformed drivers and modern fleet of trucks provide experience to help you out. Our commitment to excellence, customer service and accountability is ready to help you. If your car ever has a problem, Clover Towing is always here to help. We will come to your location and help solve your problem and get you home safely. We have steadily grown from one small tow truck to the 52 unit fleet we are today. Our fleet can handle anything from small motorcycles to large dump trucks. Clover Towing is currently the municipal contractor for both the City and Township of Langley and the City of Surrey. We work closely with the Langley and Surrey RCMP and fire departments. We are also one of BCAA’s (The British Columbia Automobile Association’s) largest contractors. Clover Towing handles over 17,000 calls for them per year. We also mobilize and move mobile fire camps all over the province of BC for the Ministry of Forests. Clover Towing is a reliable towing company servicing Surrey and Langley guests and residents with their towing needs. We strive to provide top quality services at rates you can afford. We have trusted partnerships with ICBC and BCAA. Our impound car lot locations provide a safe and secure place for your vehicle to stay while your claim is being processed. If you are stuck on the road, call our main and toll-free numbers for quick towing. We are fully committed to fast response time, excellent customer care, and reasonable prices! Yes! With our large fleet of over 50 tow trucks spread out across the Fraser Valley in Langley and Surrey, we can get to you quickly if you have an emergency, or at a pre-arranged time if your needs are less pressing. Whether you need towing from a breakdown or accident or towing for a motorcycle, or heavy-duty machinery, Clover Towing can get the right tow truck and an experienced driver to you quickly. In the event that your vehicle has been impounded, the following is a guideline of the necessary paperwork you will need in order to claim your vehicle. Hands down the best towing company in the Lower Mainland! I can see why everyone uses Clover Towing! When I called I was greeted with a friendly voice and the lady really helped me out. I do recommend their services. I just wanted to say thanks. I had a flat tire in Surrey. The guy who came and helped me out was super nice and very helpful. He got my spare working (apparently it only fits on the rear tire on my car) and had me moving again in no time. You guys are awesome! They helped me when I was in a bind with my car. Two flat tires and stuck in the middle of rural Langley. Arrived promptly and took me to a repair facility. The driver was courteous and talked to the tire repair shop manager who gave me a deal. Our towing services are able to handle your towing needs. We offer towing services for Surrey, Langley, and across the Lower Mainland. We can assist you and your vehicle if you have been in an accident or your car has broken down on the side of the road, regardless of your need for our services. Flatbed towing is useful for a variety of oversized vehicles and large objects that are difficult to move. With 35 years of towing experience under our belt, we have moved many odd-shaped items safely and securely. We provide 24/7 emergency towing Langley cars, Surrey and Langley towing services, dead battery jump-start services, gas delivery, and flat tire change.